Another of the LEGO kits I bought at Toys R Us's recent sale was the Castle-series kit 7009 "The Final Joust". This is a small kit that would normally retail for $7.99 US but in Canada retails for a zillion dollars, or some other ridiculous amount. But enough about Lego Corp's inability to understand currency conversion, let's talk about the set. The main theme of this set is a jousting match between an evil skeleton and a good knight. You can tell that the skeleton is evil because he looks angry; his eyes are red, he dresses all in black, and he's a skeleton. These things always indicate evil. The skeleton in this set is armoured, which is implemented by the simple means of it being a regular minifig body with a skeleton head. The result is pretty good; the skeleton has one of the helmets introduced in the KKII line that looks really nice with the body armour. The good guys are represented in this kit by a knight wearing full armour and sporting the popular pointed visor helm, now in a shiny metallic finish. The rest of the set is a fence, alongside which the competitors joust, and a weapons rack. Overall this kit is pretty good, parts-wise; nothing in the set is wasted or useless. My only complaint is that the inclusion of two horses means the kit is expensive considering the meagre contents. I've never really been a fan of LEGO horses but I can appreciate that other people like them a lot and want whole troops of mounted warriors. That's fine, I guess, and this kit is a good source of said warriors. The minifigs themselves are pretty good, but not perfect. These days a perfect fig is fully printed and comes with extra pieces; LEGO has cut costs over the last few years and no longer makes such ideal figs. Thus these figs are perfect in their default configuration: They look good in their armour and come with a good set of weapons. But their torsos and legs are blank, which means if you take off the armour you get two guys (one really pale guy) wearing their pyjamas. Given the cost realities I won't hold this against LEGO but I miss the days when figs had printed torsos and legs AND a full armour set including plumes (which sadly won't be included in any future LEGO lines for cost reasons... sigh). The jousting fence and weapons rack are nothing impressive by themselves but are a good source of specialized bricks, including arches, dark-blue jumper bricks, bricks with claws in the middle, and those gold roof pieces (if you like the new Castle theme colours, those are invaluable for decorating a bigger castle). My recommendation for this kit is: at the US retail price it's reasonable, and worth buying. 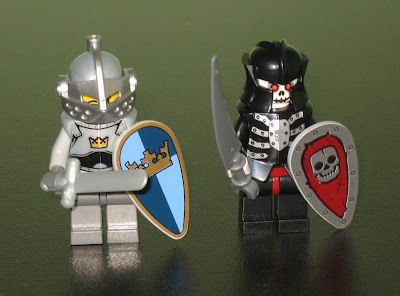 LEGO has listened to the criticisms of their widely-panned Knights Kingdom II line, and released a good line of Castle products with a good assortment of good guys, bad guys, and parts. Gov. Timothy M. Kaine's report on the Virginia Tech shooting was released a few weeks ago. I decided to read this report in order to see what it said; would it be a case of finger-pointing and 20/20 hindsight? The report starts off on a bad foot. It claims from the outset that "the system" dropped the ball and that people should have been warned about Cho's dangerous nature. However after reading through I find that most of the report is, in fact, grounded in reality and does not make recommendations which are overreaching in nature. He was enrolled in an Individual Educational Program to deal with his shyness and lack of responsiveness.... Therapy continued ... through his junior year. He had no behavior problems, kept his appointments, and made no threats. He got good grades and adjusted reasonably to the school environment. Both the guidance office in school and the therapist felt he was successful. He graduated with a 3.5 GPA in the Honors Program. there are suggestions that Virginia Tech should have told Cho's parents about his detention at a mental health facility, or that Cho's high-school should have informed VT that they were about to accept a monster into their classes. However the reality is that Cho, in high school, took part in a mental health program which helped him deal with his shyness and allowed him to adjust reasonably to school. His behaviour and grades were excellent and both his therapist and guidance counsellor felt they were successful. The problems began when Cho couldn't deal with the university life, due to his mental illness. However the notion that the school should be calling his parents is a dangerous one: at some point children have to be considered adults and the schools should not be interfering by bringing in his parents. It's not up to the school to make such a decision; for one thing he may not even be on good terms with his parents. If the school felt he was a danger and they couldn't have him on campus, that would be their decision, but the decision of what to do with him afterwards should not involve calling his parents. Anyway, Cho was forced to seek mental help while at school. The problem is, identifying psychopaths is not easy. A psychiatrist ruled that Cho was not a danger to himself or others, but subsequently a judge ruled that he was. Clearly the psychiatrist was wrong (though the danger may only have arisen later), but the real problem with this part of the story is that Cho was sentenced to out-patient treatment but he did not complete the treatment. Neither the designation as a dangerous person, nor his failure to complete the treatment were recorded, and he was not arrested. Furthermore, his designation as a dangerous person made him ineligible to purchase firearms in Virginia, yet the requisite paperwork was never filled out, so the gun dealer didn't turn up any issues when he did a background-check. No one from Virginia Tech ever told his parents about his detention at a mental health facility, his stalking of students or his macabre writings. (The Toronto Star, via AP). I know several people who never participated in high-school classes; should this be grounds for barring a student from school, or putting them on a watch-list? Please. The remainder of the report, however, is very balanced. It discusses the logistics of cancelling classes, and other things the VT staff could have done to increase student safety. The conclusion is that cancelling classes or locking-down the buildings was impractical or impossible, and would have had little benefit. Indeed they mention situations where a gunman had counted on a disturbance which brought people out of buildings, so that he could shoot them. Locking down the buildings could have locked thousands of students outside with Cho wandering among them. The real recommendations of the report are that the VT safety committee was not well equipped to communicate quickly and they reacted slowly to the problems. This led to a significant delay in the emails sent to students which mentioned the first killings; the result was that by the time the university sent out the warnings Cho was moments away from starting his second killing spree. The report notes that the university lacked a good communication system, but that one was under-construction at the time. Alerting students sooner would likely have had the effect that someone would have been more alert and reported the chains on the doors of the building Cho was in. However, the report states on page 87, "Despite the above findings, there does not seem to be a plausible scenario of university response to the double homicide that could have prevented a tragedy of considerable magnitude on April 16." Accordingly the report suggests that the physical security of the buildings could be improved; had the classrooms been equipped with locks Cho would have been unable to enter more than one room; had the building doors been impervious to chaining-shut the police could have entered sooner. These are sensible recommendations that will likely be adopted by buildings around the world. The VT report was an opportunity to spread much blame around, but in the end common sense prevailed. Simple physical security, rapid response from the campus safety team, and preventing the sale of firearms to designated-dangerous persons are all that are needed here. Like the alchemists of yore, Danie Krugel has a secret invention that can perform miracles. Simply provide a sample of a person's DNA, such as a hair from their hairbrush, and the machine will, using quantum physics and DNA, pinpoint the person on the globe within meters. Even if they are dead and have been buried for several years. Supposedly Mr. Krugel has used this machine to find the bodies of some children, dead for over 20 years, and he has now located the body of Madeleine McCann. The Portuguese police, however, acting on his suggestion, brought in forensic sniffing dogs, and the dogs detected traces of evidence in the McCann's suite, which implicates them. A search of the beach where Krugel claims Madeleine is buried has not been performed. The sheer audacity of Krugels claims is astounding. I can't help but think that he hasn't caught on to the fact that a good portion of the developed world is highly educated and also communicates amongst itself. In the old days, Snake Oil Peddlers[*] would sell products claiming nearly magical effects, often resorting to a scam where an accomplice in the crowd would deliver a fake testimonial about the product. This scam was successful because people didn't know biology or chemistry and weren't all that good at science or testing the validity of someone's claims. These days it's different; there are hundreds of experts in the world who can hear "DNA + GPS" and immediately tell you that there's no way these can find someone. For one thing the GPS satellites don't watch over us, they tell you where you are because the GPS receiver in your hand deduces your location by the location of the satellites. It's as if three blind people in a dark room are constantly saying "It's 3:45:23 and I'm next to the sofa", and you use this information, based on what time it is when you hear them speak, and based on the direction they are coming from, to figure out that you must be next to the toilet. The blind people don't see you and in fact keep telling their location even if you're not there. So I can't ask them to find you. Second, DNA is a molecule. Even if there was a foolproof way to (quickly) take two DNA samples and identify that they were the same[**], you'd still need some way to FIND a second molecule somewhere on the planet. The planet is a big, big place. We find stuff that's been missing for a long time, stuff we assumed was lost for ever. In order to find something, especially a unique thing, you need to know where to search. And the possibilities are essentially endless for a human. Look at the long list of missing persons, people whose last known whereabouts are very likely right nearby their final resting place. Jimmy Hoffa. Natalee Holloway. The list goes on and on. There's a reason we haven't found these people, and that's because the search space is too large. There's just no way to search every possible place to find their body. And now Mr. Krugel is claiming that he can find a tiny piece of their body... it defies belief. psychic debunker James Randi has a million dollar prize for anyone who can demonstrate paranormal powers like these. Krugel’s claims fit the bill perfectly. Why not use the device to locate Randi, and claim his million? The technology needed for this machine would be astounding; there'd be a Nobel prize for sure, not to mention government contracts and rewards posted by people who want to find their lost loved ones. But Mr. Krugel isn't doing any of these things, most likely because he'd be exposed as a fraud. Sadly, Mr. Krugel has already victimized some people. Hopefully by spreading the news about him we can prevent others from also being conned. * Ironically Chinese snake oil actually contains pain-fighting ingredients, and is a real, respectable product. The Wikipedia page has more details. As a kid I remember learning that paper couldn't be folded more than 7 times without using a tool to compress the paper. This fact figured in an Encyclopedia Brown story, where one of E. Brown's friends had a collection of toilet paper, and the local bully claimed to have folded the paper 8 times to fit it somewhere, but E. Brown demonstrated that it was impossible. Naturally I tried myself to fold a sheet of paper and was foiled around 6 or 7 folds, because the wad was too small to bend. Intuitively though, I thought that there must be a way, if only the paper were bigger. Then I saw on TV (some science show) where the host ridiculed his assistant who claimed to have folded a newspaper sheet 8 times. The last fold was pretty bad but given how small the wad was, it wasn't surprising. I was young so I considered the question solved, because, if a bigger sheet would help, wouldn't they try it on TV? Today I was thinking about the problem again, because I bought some furniture and it came in a box, which I was folding down to recycle. Folding cardboard is hard but it got me thinking that even with its high thickness I can still fold it, so why not a thick wad of folded paper? I wondered if I could dust off my physics knowledge to determine how big a sheet of paper would need to be for you to fold it. The hard part of folding is that a single sheet folded 5 times is 32 sheets thick... but if you had a sheet that was much longer it wouldn't matter if it was thicker. I could work out the formula by calculating the force needed... ugh. Why not Google it? This just in: politicians change their minds. However, it seems they can never do so without being accused of "flip-flopping". This negative term is poison and should be banned from political journalism. The journalist is obviously trying to paint the politician as indecisive or implying that the politician is lacking something for having taken two contradictory positions on an issue. But the truth is, "flip-flopping" is weasel-speak for "changing your mind". And guess what? Changing your mind is what rational people do when confronted with new information that invalidates your previous position. It's very simple: based on the information you have, you adopt a position on a topic. Say, asbestos. Originally people thought it was a good thing, since it is a very effective fire retardant. People said "Asbestos is Good". Then people learned that it caused cancer. If a politician had been pushing for the adoption of asbestos, and then changed his mind once he learned it caused cancer, he'd be accused of flip-flopping. Never mind that only a moron wouldn't change his mind in this case, when you're a politician you're damned if you do, and damned if you don't. To all journalists: Please ban the phrase "flip-flops". It is loaded and unnecessarily biased. I promise I won't proclaim "Journalists flip-flop on using the phrase 'flip-flop'".